Having carried out research for a PhD in peatland ecology he was appointed peatland specialist in the Nature Conservancy in 1967 and became Assistant Chief Scientist in 1976. He carried out a comprehensive review of peatland conservation in the UK as part of the Nature Conservation Review, which led to many newly discovered peatlands being designated as National Nature Reserves or SSSIs. During this period he worked briefly with UNESCO to develop criteria for selecting and establishing Biosphere Nature Reserves. He also chaired a government committee to investigate the causes of lead-poisoning in mute swans, which recommended banning the use of lead weights in angling. As Senior Ecologist at the Greater London Council (1982-86) and subsequently Director of the London Ecology Unit (1986-2000) he developed a major London-wide programme for biodiversity conservation which became a model for many other towns and cities. This programme was adopted by the Mayor of London in 2002 as the basis for biodiversity conservation in the capital. He was Head of Environment at the Greater London Authority from 2000 to 2004 with responsibility for producing the Mayor’s Environmental Strategies, including Waste Management, Air Quality, Biodiversity, Ambient Noise and Energy. During this period he was instrumental in promoting effective policies for sustainable development which formed a crucial element of the Mayor’s statutory London Plan. He has written extensively on biodiversity conservation, particularly in relation to wetland ecology and the ecology of major cities. As a member of the UK Biodiversity Group in the 1990s he was responsible for developing Local Biodiversity Action Plans, and was a member of the England Biodiversity group from 2004-9, with particular responsibility for towns and cities. In 2006, as Special Advisor to the Royal Commission on Environmental Pollution, he wrote a report on Biodiversity and Green Infrastructure as part of the Commission’s work on the Urban Environment. 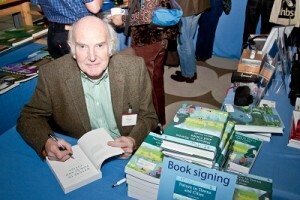 As well as numerous papers on ecology and conservation he has written two books on the ecology of cities, Wild in London (1986) and a Collins New Naturalist volume Nature in Towns and Cities (2014). He also co-edited Ecology and Design in Landscape (1986) and the Routledge Handbook of Urban Ecology (2011). He is a regular contributor to The Nature of Cities interactive web-site. In addition to his work in London, he has worked on biodiversity conservation in cities such as Shanghai and Nanjing in China, Santiago in Chile and Portland Oregon, USA, and was one of the founders of the European Academy for the Urban Environment in Berlin in 1992. He is a founder member, Fellow and past-President of the Chartered Institute of Ecology and Environmental Management, of which he is now a Patron. He has been a Visiting Professor at University College London since 1994, and was Honorary Professor at East China Normal University from 1996-2001. He has chaired several national environmental NGOs, including the Tree Council (1992-4), and was a Director of the National Forest Company (1998-2004). He is a Fellow of the UK Man and Biosphere Urban Forum and a member of the IUCN World Commission on Protected Areas and its Urban Specialist Group. He was awarded the Heidelberg Prize for Environmental Excellence in 1999 and the CIEEM Medal in 2015. As well as being a professional ecologist David has been an enthusiastic naturalist since the age of fourteen with a particular interest in birds and has contributed substantially to the work of many natural history societies in promoting greater awareness of the natural world among local people.